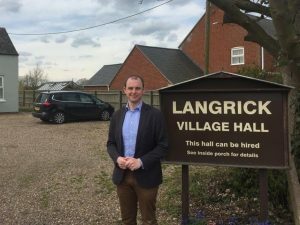 Matt Warman, MP for Boston and Skegness, has welcomed the Government’s announcement of £408,000 for projects across Lincolnshire’s coastal communities under the Coastal Communities Fund and Coastal Revival Fund. The announcement sees £370,000 in funding to provide career and skills development to help future-proof the coastal tourism sector in Lincolnshire, as part of the Coastal Communities Fund, as well as £38,000 awarded to the Parish of Boston to begin a project to revitalise the Blenkin Memorial Hall. Nationally, the Coastal Communities Fund provides £36 million invested in more than 71 projects in towns and villages along the English coastline, providing jobs for local communities and attracting visitors to our coastal towns. Lincolnshire’s project, led by the Greater Lincolnshire Local Enterprise Partnership (LEP), will create a ‘Greater Lincolnshire Coastal Skills Pathfinder’. This will provide tailored workforce and career development support for 320 people, working with over 100 coastal businesses to develop a Visitor Skills Plan for the Lincolnshire Coast. Coastal Champions will also act as role models and link into the LEP Ambassador scheme. In Boston, the funding granted under the Coastal Revival Fund will kick-start work which aims to regenerate the Parish’s 17th century Church House, and adjoining church hall to create a central community venue. Both funds are part of this Conservative Government’s wider plan to invest in towns and villages across the country, ensuring people and businesses in communities along our coastline can thrive. The funding will create new infrastructure for visitors and protect and enhance cultural attractions, as well as supporting local businesses.